While Pool C may have lacked in the high drama of Pool B, it still supplied what could be one of the signature events of the tournament. The games were going to seed until the third round when top seeded Doublewide and two seed Ironside met in the final round of pool play. Ironside came away with the victory and relegated Doublewide to a prequarters meeting with GOAT. Meanwhile, Ring of Fire struggled to return to last season’s semifinal form by being edged out in both of its games against the higher two seeds in the pool. At the bottom end of the pool, Condors failed to get anything meaningful going against any of the storied programs it shared Thursday field space with. Doublewide’s final 14-9 win against Ring of Fire belies the actual speed of the game. Neither team walked away form the game without feeling like it had battled previously. For Doublewide, the game was all about establishing itself. Captain Jerrod Wolfe said that his team was focused on its sideline work and ironing out any kinks that appeared in the offense. Meanwhile, Ring’s Taylor Pope spent most of the day in process mode, discussing how his team was improving game by game and bit by bit with Friday in mind. Ironside came out on fire and put Condors to rest early with a 15-8 victory that set a tone for an efficient remainder of the day for Ironside. Ironside and Ring of Fire met in a 2v3 matchup that was very important, in this pool, especially, for gauging if either of the non-one seeds were true contenders in the national scene. Ironside came out hot with suppressive defense that forced Ring into a very stagnant offensive state for the first part of the first half. That stagnant Ring led to a 5-1 Boston lead and everything was looking mighty comfortable for Ironside. However, Ring captain Taylor Pope saw his young and inexperienced team slowly gain confidence and chip its way back into the game. Those fundamentals brought Ring of Fire all the way back to an 11-12 deficit but Ironside managed to hold on to its lead and get one break back to win 14-12. Again, the Condors were unable to challenge their opponent and Doublewide easily rolled to a 15-9 victory over Santa Barbara. While Doublewide had cruised easily, the team knew that it had to get past a traditionally tough Ironside team to maintain its status as the one seed in its pool. Ironside came into the game with a chip on its shoulder, after receiving its lowest seed since its inception and losing its Regional title (previously belonging to a Boston team since 1995). Boston needed a big win to establish itself as a contender at this tournament. While a consistent offense is important for a team to win big games, its difficult to do so without a defense that can earn turnovers and convert those turnovers into breaks. Ironside rode the backs of strong defense that was riding the back of Will Neff to a three goal lead late in the game, 13-10. Neff was a vital part of Ironside’s defense and has been a welcome addition to the roster after coming back from a wrist injury. Though Doublewide would close the gap to 14-12, it could not stop the consistent Ironside offense from punching the disc in for the win. Ring of Fire finally pulled together the complete performance that it had been looking for all day and defeated the Condors 15-8 to secure third place in its pool. Pope declared that his team was not worried about whoever it would be facing in prequarterfinals as long as they were progressing. See more photos from the College Championships on UltiPhotos. Michael Aguilar is a reporter for Ultiworld. 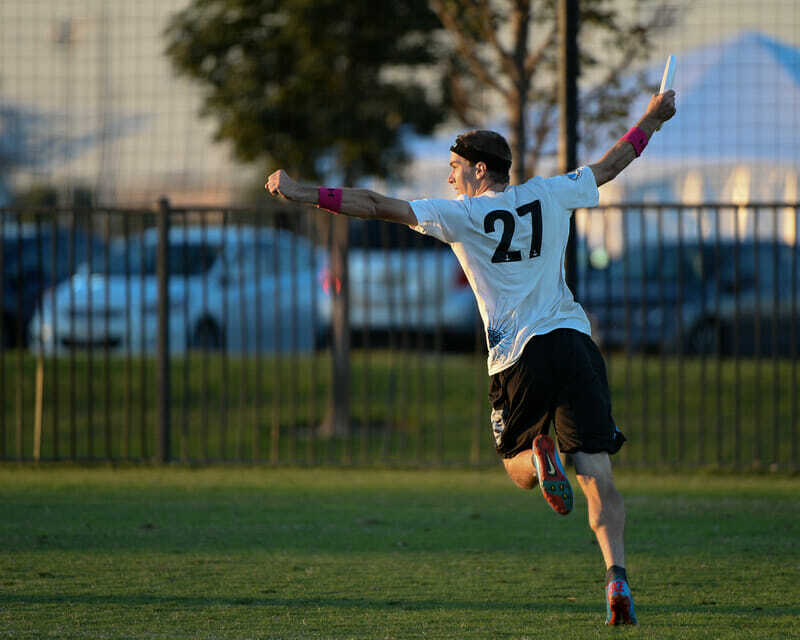 He began playing ultimate in the summer of 2008 at the urging of a few University of South Carolina players. He played for USC in the spring of 2009 and for LSU in the spring of 2011. In his spare time during those years, he ran one of the first ever ultimate news blogs, Movin' On Up. He was the head coach of Catholic High School in Baton Rouge, LA, from 2011-2016 and the assistant coach in 2017. He owes all his success to his loving wife Kendall. Comments on "Pool C Recap: Men’s Division"